Some days, it’s a struggle to stay “on” for your kids. That’s why I decided to start using The Shout Out Box. At the beginning of the year, we are an exploding volcano of compliments. “WOW! I LOVE the way Suzy is walking to her chair. Ooh wow…look at the way she is sitting on her bottom!” We sugar coat everything in the first few weeks so much so that we find ourselves feeling like Violet Beauregard headed for a sugar coma. Our honeymoon phase quickly diminishes, however, and our oohing and ahhing evolves into, “SUZY! PLEASE COME BACK AND PUSH IN YOUR CHAIR!” by week three. (Granted – those are the words that I shout in my head and it usually comes out still sugary and sealed with a plastered grin). Over time, the kids start getting sick of our voices and our compliments can become superficial, at best. I’m sure my kids get sick of hearing my voice come Friday. I took a few moments to have a pity party about the fact that my kids don’t sit at my toes and sing with me like Snow White and her precious animals. I suddenly realized – whose voices do they NOT get sick of? Their own. They LOVE to talk to one another. I wanted to use their voices to my advantage. And it worked. 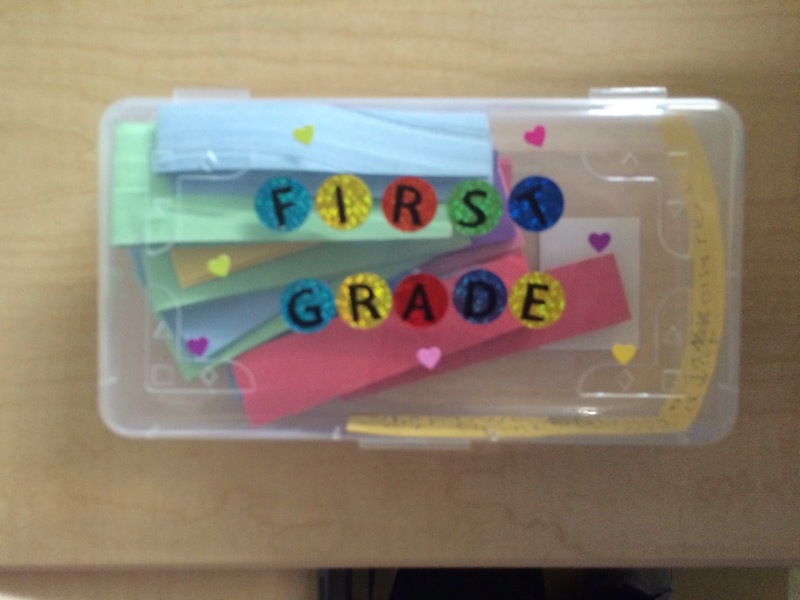 All you need is a pencil box and strips of construction paper. I’m not joking – that’s IT. Unless you feel so inclined to use stickers…in that case, I might have told a white lie. Meet: The Shout Out Box. I started to see that maybe Suzy didn’t push her chair in earlier because she was helping John pick up the pencil box he spilled. Maybe Billy was talking to a neighbor because they were using an AMAZING reading strategy during Daily 5 time. You will be blown away by the compliments that stick out to your kiddos. Where can I find the box? (I kept mine on the window sill with a stack of construction paper strips stored immediately next to it). After I feel that my students have a strong understanding of the box, I make a huge production of placing it on the window sill and make sure to share just how EXCITED I am to see what great things they do for their friends that I might not always see. Be warned: your box will be overflowing the first few days. Despite our rule that we only have 2-3 people writing a note at one time, I was more lenient with the lines that accumulated at the window the first few days. I did not want to discourage them from finding those little nuggets of sunshine in our room. I chose to share the shout outs daily. However, you might choose to do it weekly. Totally up to what your class needs. The student receiving the compliment got to walk up in front of the whole class and take the compliment home. They were eating it up. Some of your friends will take these compliments to heart so much so that you’ll find them peeking out of their desk pockets and cubbies for weeks. Compliments from their peers can mean so much more than the superficial ones we often let ourselves fall into. Take note, however, of students who might not be receiving compliments as often as others. You might need/want to write a few compliments of your own! 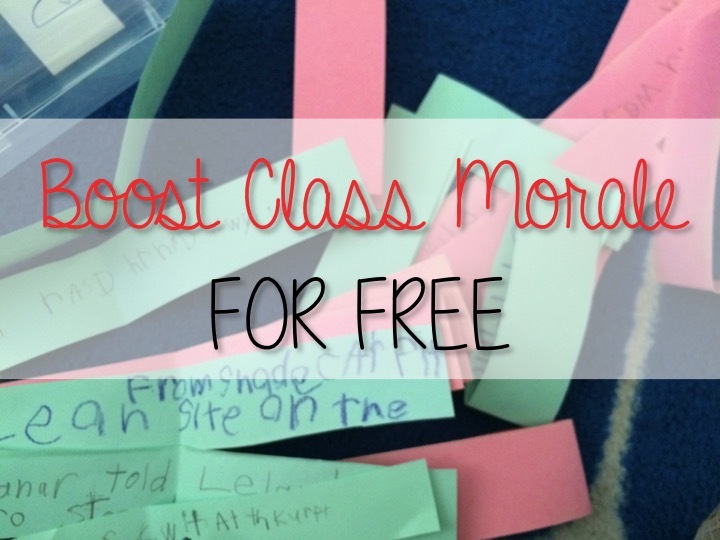 How do you boost class morale? Post in the comments below!